Does your film pass the Bechdel Test? 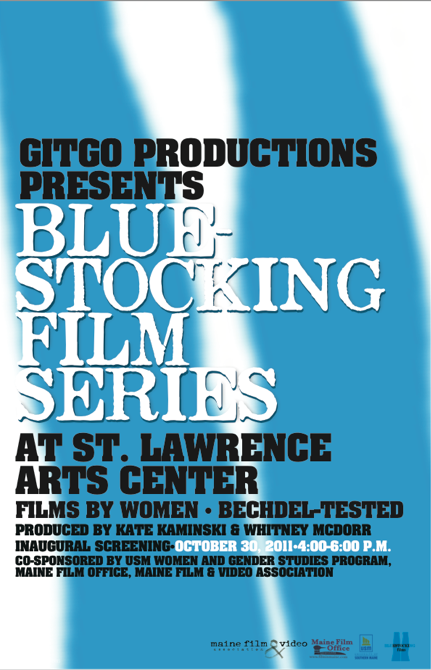 Submit it now to the Bluestocking Film Series! Bluestocking fall deadline extended to September 30! The deadline for the fall Bluestocking Film Series screening event has been officially extended to September 30. The screening will take place on October 28th. Interested filmmakers will find all other rules and regs spelled out under our WAB listing and are encouraged to use WAB for entries where we accept rolling submissions. However, we will also accept films submitted as outlined below. Please note that films submitted through WAB receive a discounted entry fee of $15 – the fee for films submitted otherwise is $20. We are willing to waive fees under certain circumstances. If you would like to inquire about fee waivers, please email us at gitgoproductions@gmail.com. Please note that online screeners must be available for us to consider fee waivers. Click to submit your film via Withoutabox! ==> Short films of all categories not exceeding 45 minutes in length will be considered. We prefer shorter films – in the 10 minutes or less range. ==> The director of the film must self-identify as a woman and any co-director must also be a woman. ==> The film must pass the ‘Bechdel Test for Women in Movies’ (FMI, click link below). We are most interested in fiction films that portray women as complex, intelligent human beings. ==> If not submitting through WAB, your submission fee of $20 must be included with your screener (checks made out to: Gitgo Productions). To pay submission fee via Paypal with credit card, please email gitgoproductions@gmail.com for instructions. Submissions will be accepted on DVD (Region 0 or 1) by mail to Gitgo Productons, 161 Fort Rd., South Portland, Maine 04106. Again, the new extended deadline for submissions is September 30, 2012 for the October screening. We look forward to seeing your film! The Bechdel Test: get to know it! Never heard of the Bechdel Test? Heard of it, but don’t know exactly what it is? It’s about movies. And women. And what they talk about. And to whom. But watch the video below to get a full explanation! Check out this video from Feminist Frequency‘s Anita Sarkeesian which brilliantly explains what the test is and why it’s important. Also, be sure to take a look at the Bechdel Test Movie List site to see which films do and do not pass. You can even submit your own reviews of films! Frozen River (2008), Happy-Go-Lucky (2008), The Descent (2005) and Lakota Woman: Siege at Wounded Knee (1994) are a few Bechdel Test-passing films I like. Which are some of your favorite movies that pass the Bechdel Test? Have you MADE a film that passes the test? Send me a link to your website! Her Film: Your biannual film series is the only one in the world (as far as I know) to require films submitted for consideration to pass the now-famous Bechdel Test. Can you talk about the importance of the Bechdel Test to you as a festival runner and what impact you see it having within filmmaking? 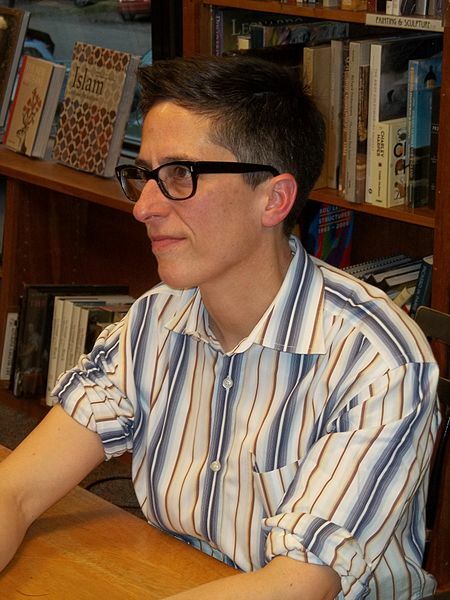 Kate Kaminski: The Bechdel Test is a crucial piece of the Bluestocking Film Series because as you point out, after the main requirement that the director of a film be a woman, we’re using it as the most basic criteria for entries. When we set out on this journey a year ago, our motivation was that we really just wanted to see more films that explored women’s lives, our experiences, and our relationships with each other – separate from men. I’m not a big fan of commercial filmmaking in general because I’ve grown utterly bored by the male-centered POV that carries most films you would see at your local multiplex. Of course the Bechdel Test is deceptively simple and doesn’t guarantee a particularly female-positive slant nor does it make a film necessarily feminist. In some ways, it’s proving to be way harder than I ever imagined it would be. I keep getting submissions from very worthy women directors and the films don’t pass. I can’t figure out if these submitters aren’t reading the “fine print” – though we try to put the Bechdel Test front and center wherever we advertise the BFS – or if they’re just hoping we’ll ignore it. It’s almost disheartening. I suppose I was a bit naïve to think a) that it would be cinch to get loads of woman-directed films that b) passed the Bechdel. That being said, I’m now digging in for the long haul and standing by my commitment to the test as a basic criteria – and, believe me, I’ve met with some pressure to jettison it. I’ve also had some very positive responses from women filmmakers about our using it as a basis for entry. As far as the Bechdel Test having an impact within filmmaking, I would have to say, from what I see, the answer is…not so much. At least, not yet. Frankly, it’s not enough to make a film that passes the test unless the impetus is to express a deeper understanding of what the test implies about women’s stories and their importance to all of us. It’s my hope that the BFS will generate discussion – and production! 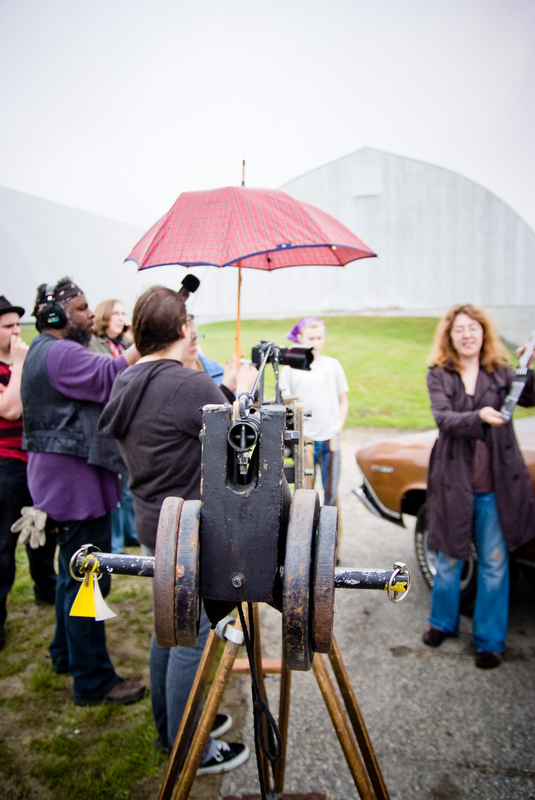 – among women filmmakers – and maybe even spark a revolution. I’m all about a cinematic revolt in this country – for all genders, races, and beliefs. HF: Is the BFS for you part of a larger feminist engagement with the community and with women filmmakers? How does the series specifically fit within your mission as an artist and/or as a female artist? KK: It’s definitely about engaging with other women filmmakers. 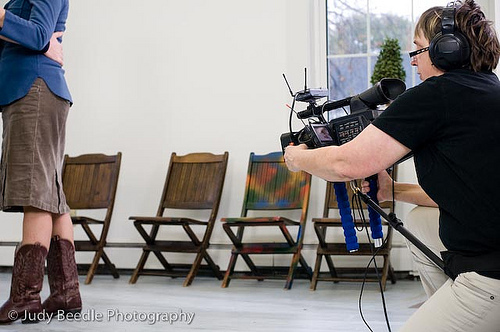 Living in Maine, my filmmaking partner (Betsy Carson) and I sometimes feel lonely and marginalized. I don’t necessarily see the BFS as a vehicle for showing our own films, though I’m tempted to try to convince Betsy to make one with me specifically for the series. For me, the BFS is much more about going outside our little corner of the world and bringing back to our community woman-directed films that would otherwise never be seen and that also express the rich diversity of our experience as women. It’s not about excluding men – it’s about introducing women’s voices into the mix. Back in the 90’s we had a women’s film festival here and it didn’t last. There was also a Maine Women and Girls Film Festival but I don’t think they’re doing that anymore either. We’ll see how this goes. I choose to believe that we have an audience – that people of all genders are hungry for what we want to show them. As far as feminism is concerned, I’m increasingly dismayed by the cultural shift away from that as a positive value, so, yes, it’s also about a feminist agenda. I would definitely like to see more women making films that express feminist ideas. KK: Well, we’ve only had one screening – last October – so our track record is short. But the audience last October was amazing. Very enthusiastic – very supportive – and we were only half a dozen seats away from completely sold out, so I’d say it was a rousing success, especially when you consider that we didn’t have a budget for advertising, etc. The make up of the audience was young and old, women and men. But as far as racial diversity, you may not know that Maine is one of the “whitest” states in the nation. We are also a very poor state, economically, and not everybody has even the $5 we charged for that premiere screening. Unfortunately, we do have to raise the ticket price going forward, so it comes down to (literally) who can afford to shell out $10-15 for a “special event” like this – not everybody can do that. As we move forward with the series, we’re discussing taking it on the road and traveling around the East coast with it. We’d also like to expand it ultimately to the internet, as an online festival – it kind of goes without saying that the online world offers incredible diversity both in the filmmakers and audience. HF: I’ve read perspectives on women’s film festivals that are both positive and negative, positive meaning that women’s film festivals provide a forum for women-made films, and negative because these festivals could be considered a type of “ghettoization” of women-made films. As a filmmaker and festival runner, do you find yourself torn between these perspectives, or do you give credence to the negative perspective at all? KK: To me, this idea of the ghetto is a patriarchal construct – let’s face it, one person’s ghetto is another person’s community so I’m actually fine with it regardless. 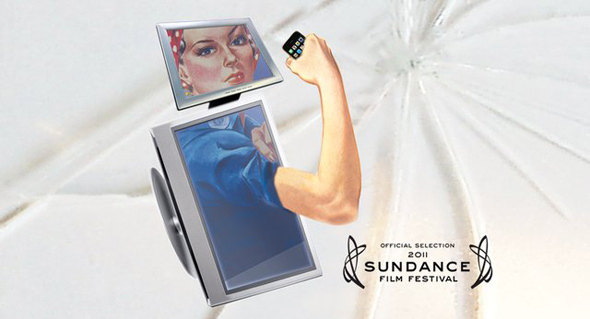 And women’s film festivals level the playing field…at least theoretically. HF: The recent documentary film Miss Representation by Jennifer Siebel Newsom on media representations and political involvement of women and girls has helped bring the phrase “You can’t be what you can’t see” to the fore. Filmmakers whose films are selected for the BFS see their work shown to other women, so how do you see this interaction and engagement between and among women and women artists affecting what they consider to be possible? In other words, do you see a broader consciousness shift happening to which the BFS may be contributing? KK: I think it’s absolutely critical to feel like you’re part of the “guild” of filmmakers, part of the craft and history of the art when you’re making films. And, by its nature, art is inclusive – but if you’re a woman making films about the experience of being female, it can seem like your work is “out of sync” with “what you see” [being made by mostly male filmmakers]. To be a small part of a bigger wave of “possibility” for women in the arts is exciting. I would dearly love to see a consciousness shift and if the BFS can contribute to that, it would be a beautiful thing. The film entry deadline for the Spring 2012 Bluestocking Film Series is April 15. 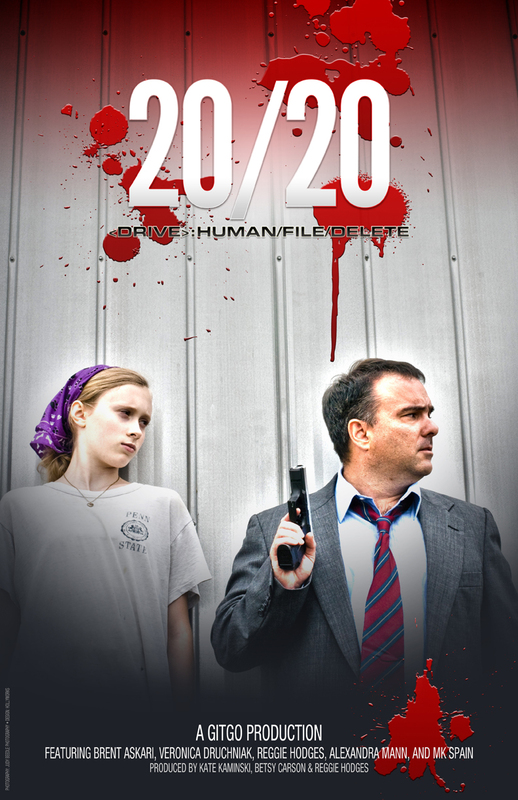 The screening will be held on May 20, 2012. “Peace Unveiled,” the third in the five-part Women, War and Peace series aired Tuesday on PBS in the U.S. This film focused on the work of three particular Afghan women to reestablish their rights and participate in the peace process to have a voice and a place at the table. The details about the realities of life as a woman in Afghanistan were sobering indeed, many absolutely shocking, and there was a lot that I think most women (at least in the U.S.) would have no idea had happened or was still happening: women risking their lives to run for political office, death threats against women teachers, routine death threats against women’s children — women who refused to become slaves of the Taliban (“cut off your children’s heads and burn your daughter” types of threats). The role of the U.S. government in the peace talks was fascinating to hear about, especially as the reality is not something that mainstream media in the U.S. shares with the populace. The media is called the Fourth Estate for a reason, and is supposed to support democracy and the free flow of information, not suppress it. Watch Democracy Now! on LinkTV hosted by Amy Goodman if you want to hear more accurate information and hear and see women who are involved in peace movements and political and direct action. Abigail Disney, the Executive Producer of the Women, War and Peace series, was interviewed by Amy Goodman on Tuesday. Watch the interview here (9m 50s). Many quotes from the film were shared through the #wwplive tag as we live tweeted during the broadcast. Prolific tweets abounded, with some of the most active people being Women, War and Peace @womenwarpeace (with the director of the episode, Gini Reticker, leaving her comments labeled with “- GR, ” so we could tell it was her), The White House Project @TWHP, The Opinioness @OpinionessWorld, Katherine Mullen @MullenKat, Gayle Tzemach Lemmon @gaylelemmon, Peace Is Loud @peaceisloud (I LOVE this handle! ), all of whom are very much worth following if you don’t already. Next week will be “The War We Are Living,” the fourth film in the series. If you are in the U.S., please check here for local listings to see what time the film airs your PBS affiliate. Come live tweet with us, too, if you can! Just tag your posts with #wwplive. If you have missed the other episodes, you can watch the first two online, and each episode is made available for viewing online several days after the original air date. *The film’s subject, Raicho Hiratsuka, was a pioneer Japanese feminist and the film’s director, Sumiko Haneda, is one of Japan’s leading women documentary filmmakers. Read the ABWH’s Open Statement and the story in the Kansas City Star. I say hear, hear. While I wanted to see the film based on hearing about the book, I’m bothered by this concern over the historical inaccuracies and distortions present in both the book and film according to this statement. We all know that Hollywood misrepresents history and the lives of racial and ethnic minority groups and women, and often disinforms us (not just misinforms us — see Black Hawk Down as an egregious example of this.) Have any of you seen the film or read the book — or better, both? This started me wondering if there is a positive way to spin the “for women” phrase. Can it be positive instead of negative, meaning that the issues dealt with, or themes presented, in a film relate to women and help to cast women in a non-objectified light? Can “for women” only be understood as a reductive, essentialist phrase? What do you think? I’d love to hear people’s thoughts on this, especially as if something’s “for women,” shouldn’t that mean it’s for everyone? Doesn’t everyone need to see positive images of women and hear positive dialogue about and between women as well as between men and women? Do you find yourself affected by “for women” marketing? Do you use it or reject it when it comes to your own projects? Check out the Bechdel Test if you haven’t yet heard of it. Uh, what? I’m a bit disturbed by this because it seems as if he feels it’s inherently more interesting to put a woman or child in danger. I think that DePalma’s position is completely transparent, and that the vulnerability — or perceived vulnerability — of a woman or child character in a film somehow adds to the entertainment factor. Is that what we want from movies, though, if we’re being honest with ourselves as (hopefully) discerning viewers? Do we really want to see some of the most vulnerable members of our society being portrayed as potential victims, targets of danger or even “collateral damage” of violence? I can’t imagine another argument wherein the vulnerability of a woman or child isn’t the main reason why DePalma — or anyone else — feels that the thrill is heightened. Is there one? What do you think? Read the story “Best horror stories tap into universal dreams and fears, filmmakers say” in the Calgary Herald yesterday. Christy Jones of the AAUW Dialog Blog cross-posted a great piece by Melissa Wardy of Pigtail Pals (“dedicated to changing the way we think about girls”) about the repugnant treatment of women by ChapStick which has chosen wrongly to use the backside of a woman to advertise lip balm. What? That’s right. Read Wardy’s open letter to the company, “Dear ChapStick, We’re Through.” This isn’t exclusive to ChapStick, as we all know, and is an issue that is discussed in Miss Representation, a documentary by Jennifer Siebel Newsom which premiered on OWN last week. Read my post on the film and the Miss Representation pledge.